One way that comics have changed since I was young is that there is more knowledge of and interest in recent comics history among readers and fans. 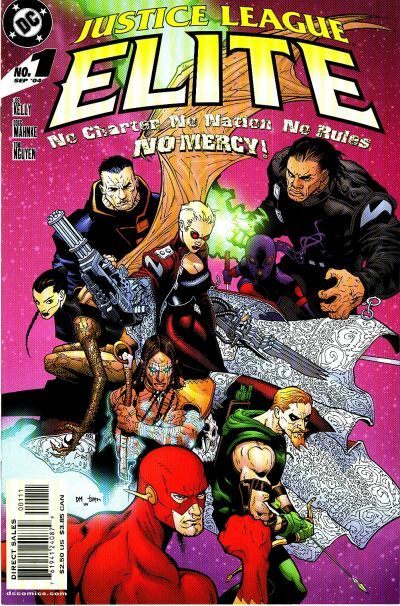 Enough to support books like this one from 2003, which brought back the creative team and characters that had been so popular in the late 1980s for a new mini-series. Alex Jay’s logo for the original title is also back, and I was asked to add the new top line. I used a mix of upper and lower case type, staggered vertically to try to capture the goofy humor the team was then known for. 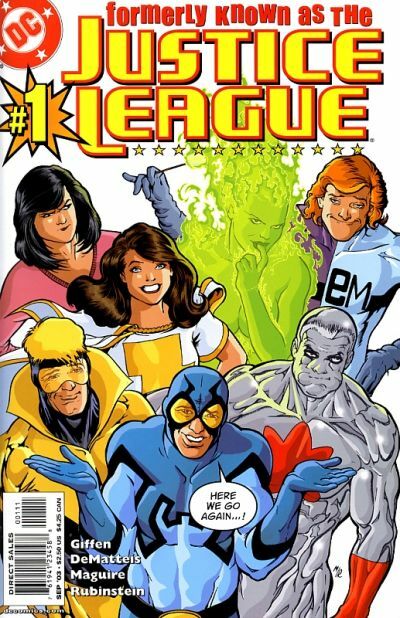 It did well enough to engender a second mini-series: I CAN’T BELIEVE IT’S NOT THE JUSTICE LEAGUE. Kudos to DC for the idea, and having a sense of humor about their own characters. A more serious series was this one from 2004. I was asked to create a logo based on the pared down version of Alex Jay’s JLA design seen in part 5 of this logo study. I used his letterforms as a guide for those in the word ELITE, and for JUSTICE LEAGUE a font that worked well with it. Getting the curved perspective to work was the hardest part, but doing this sort of thing on the computer is much easier than drawing it out by hand, as Alex had to do for his design. Also in 2004 this second animated series began. Once again the logo was created by the animation company, and Curtis King recalls it was used as received, without any changes. For once they did a logo with some comics flair. I like the shapes of these blocky letters, and the thin UNLIMITED in the telescoped drop shadow provides good contrast and adds to the three-dimensional look. Another thing I like on this cover is the fun and fanciful trade dress (the DC symbol, cartoon imp and horizontal bar at the top) by designer Rian Hughes. Rian did all those for the various DC cartoon-related books, and they’re terrific. In the last decade fan-favorite painter Alex Ross produced a series of tabloid-size comics featuring the iconic DC heroes. 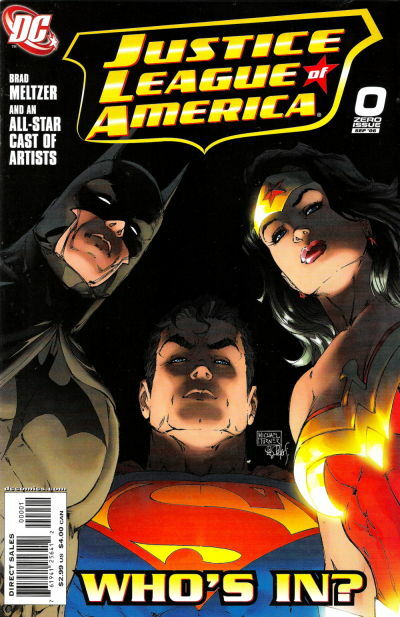 In 2003 he and writer Paul Dini turned their attention to the Justice League with this title. It’s a one-shot, but I mention it here because it fathered a twelve-issue series about the Justice League simply called JUSTICE, with covers and art by Ross. 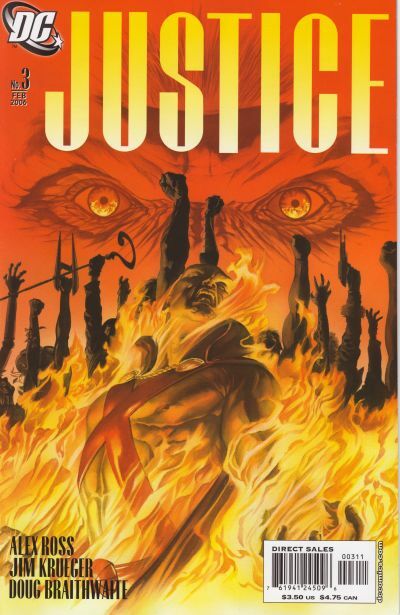 This series, beginning in 2005, used the font Alex Ross designed for its title and credits. Alex worked with DC’s Georg Brewer on this, who created digital versions of the letterforms. Alex tells me he didn’t design all the letters, and Georg filled in the gaps to produce a full alphabet, but the concept began with him. Alex has a fine design sense, and likes tall letters, as I know from working with him on the font for KINGDOM COME. These letters have an art deco feel that works well for the classic DC characters and the look of Ross’s art. I particularly like the shape of the S in JUSTICE. I would have been tempted to make the center angled stroke wider, but this is more balanced, and works very well. In this tight concept sketch for the tabloid by Alex, you can see he’s already designed the word just as it will appear on the series. The tagline FOR ALL didn’t make it to the final version. 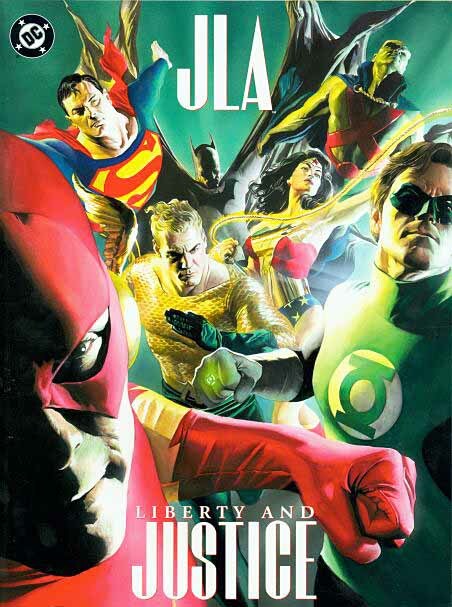 I can see why Alex used it, as it finishes the title begun in “LIBERTY AND JUSTICE”, but I like the simple one-word title for the book better, as did DC. In 2006 another relaunch for the Justice League was planned, and letterer/logo designer Ken Lopez, now on staff at DC, was asked to do the logo. The title this time would go back to the original: JUSTICE LEAGUE OF AMERICA. Ken’s first version was this one. For the letters he chose a font that is quite close in feel to the original Ira Schnapp logo from 1960, but with subtle modern touches like the slightly rounded corners on some letters, and the M using all vertical strokes. Fortuitously, the S is shaped very much like ones Schnapp used in other designs, but not the original JLA logo. The font is called Trademarker, by the way, and I’ve used it myself often. Ken made the first letter of each word larger (as I did in my 1984 version), and aligned them so they read together vertically. The “of” is lowercase and nestled in a freeform star, recalling the stars on the Schnapp original. And best of all is the partial shield shape that seems to emerge from the tip of the A and dash around the outside in a stroke that expands and then contracts again in a very attractive way. I love that idea! It has so much style and energy. And it once again follows the Schnapp original shield outline…as far as it goes. Lopez’s design is a winner. Everyone at DC seems to love it, including staff designers Curtis King and Richard Bruning, who both praised it to me. I agree. It has all the things I like best about the original logo, but envisioned in a new, modern, stylish way. I think it will be around for a long time. Great work, Ken! If there is an overall theme to this logo study, I’d say it’s teamwork. Not only among the super-heroes, but among the logo designers. Ira Schnapp set the template: block letters, shield and stars. Everyone who followed built on his theme, adding their own ideas, but often working with elements from those who came before. 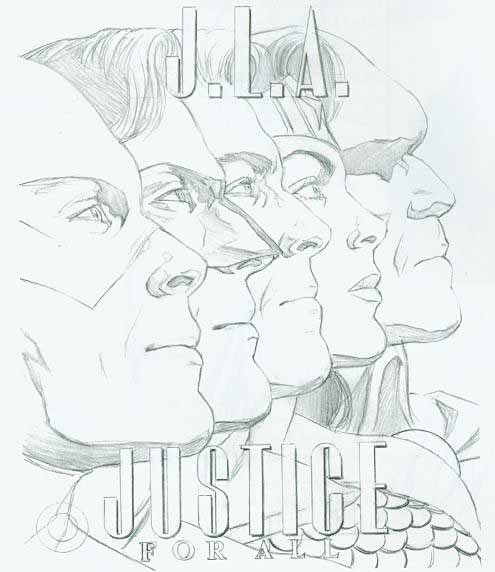 In some cases, even working together to create a good design, as with the first Justice League Task Force logo. Some characters and logos are one of a kind. Justice League calls for a combined effort to achieve harmony. Hope you’ve enjoyed this latest logo study. I’ll be back with more when I can find the time to do them. This entry was posted in Logo Studies on August 22, 2008 by Todd. Another great study, Todd! These books sure went through a lot of titles and logos, didn’t they? A few of the more recent ones really shine. I’ll be honest, the logo studies are by far my favorite part of this blog. They’re a treasure trove of design ideas and tips, with plenty of comics history thrown in along the way. Mad props! 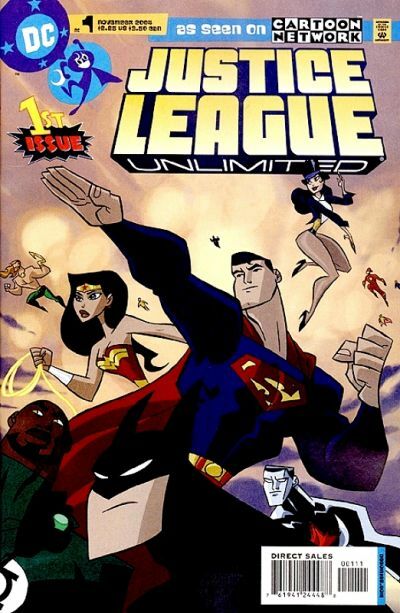 I believe the Justice League Unlimited logo was created by Funny Garbage. Same company that did the Teen Titans TV series logo and show open, and The Batman tv series logo. They do a lot of title sequences and TV identity work. A massive study, and massively entertaining. Thanks Todd – it’s amazing that with so many JLA logos there have been so few outright stinkers.